The safety of our employees and our visitors is our most important job at EPIC Systems. We take your safety seriously, and prioritize our safety policy over: meeting schedules, productivity and making a profit. 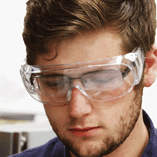 We can supply non-prescription safety glasses or the large, bulky safety glasses that fit over your eyeglasses. Please note: These are irritating to wear for extended periods. You will be much happier wearing your own prescription safety glasses. Safety shoes must be worn if you will be working in the plant or witnessing a Factory Acceptance Test. We have a limited number of safety toe caps, but they are even less fun to wear than the bulky safety glasses. It is permissible to wear closed toe street shoes for plant tours and short visits to shuttle paperwork, etc. High heels are not recommended, even for short visits. Normal plant activities do not typically require hearing protection. Your host will offer ear plugs for visits during high noise conditions or upon your request.